Identify the player who had each nickname. Which two of these TEs are the only players at that position (as of September 2016) who lead their franchises in career receiving yards? Also give the teams for which the two hold the record. 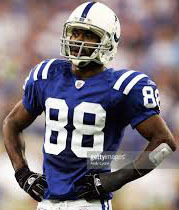 Rank the following receivers from 1 to 5 in career NFL receptions. 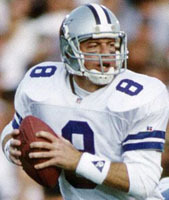 Who is the only Dallas Cowboys QB to pass for four touchdowns in a game four times in a single season? 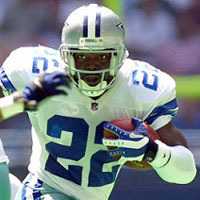 Rank these Top Five NFL all-time rushing yardage leaders in order of their total yards. 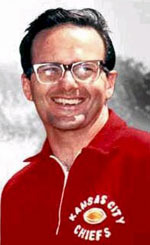 What player did original Kansas City owner Lamar Hunt describe as "the all-time luckiest thing that ever happened to the Chiefs"? Which of these NFL QBs threw left-handed? 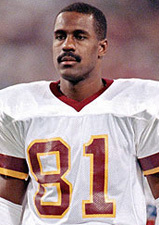 During the 1992 NFL season, the records for career receptions, receiving yardage, and receiving TDs were all broken. In the list below, which receiver held those three records going into 1992, and which one broke each of the records? What do these three former NFL players have in common besides all being cornerbacks? 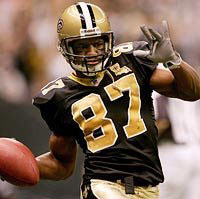 One of the receivers below led the Saints in receptions six years in a row and two others each led five years in a row. Identify the receivers in question. 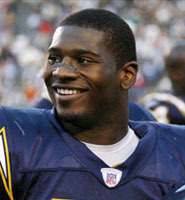 Who is the only player to catch a TD pass in a Rose Bowl game and in a Super Bowl played at the Rose Bowl? 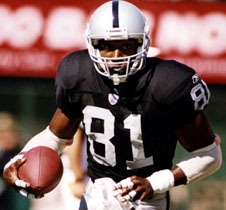 Match these NFL Hall of Famers with their colleges. Which one of these Heisman Trophy winners is not a member of the Pro Football Hall of Fame. 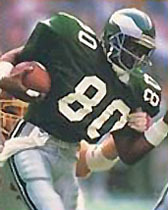 Match each NFL Hall of Famer of the Class of 2013 with his college. 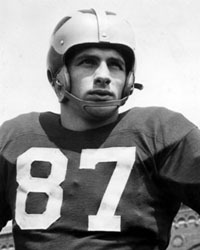 One of Vince Lombardi's key decisions as coach of the Packers was to turn this former Michigan star into the first true tight end. An outstanding blocker, he served as a "third tackle" but still had the ability to get open in the secondary. 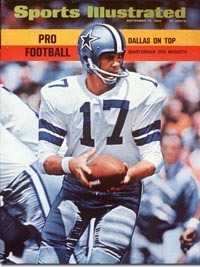 The move worked so well that he was an all-pro selectin in 1961 and '62. Who is this pioneer? Identify the four Super Bowl starting QBs who played for colleges in Louisiana. Also give his college and the team he led in the Super Bowl and the number of years he played in the Super Bowl. One of the most controversial games in NFL history was the "Tuck Rule" playoff game in 2002 when Patriots QB Tom Brady fumbled while being sacked in the final minute of play. Oakland recovered to seemingly ice the game. However, upon review, the referee ruled it an incomplete pass, allowing New England to kick the tying FG and win in OT. Identify the Raider who hit Brady on the controversial play. Each QB appeared in multiple Super Bowls with the same coach. Match each QB with his coach. Which one of the following QBs is not in the Pro Football Hall of Fame? 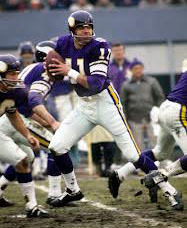 The same player was the MVP of the first two Super Bowls. Who was he and what team did he play for? Identify the two Heisman-winning QBs who are in the pro football Hall of Fame. Note: One of them did not play QB in the NFL. 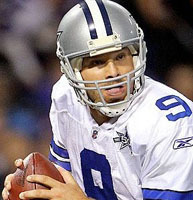 What QB led the NFL with a 105.5 passer rating in 2008? Which one of these NFL stars is not in the College Football Hall of Fame? Match each NFL QB with his college. What college did each of these winning Super Bowl quarterbacks attend? 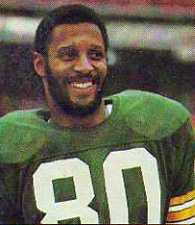 This NFL Hall of Fame DT played a supporting part on the TV show Little House on the Prairie. Later, he played the title role in the series Father Murphy. Identify him. 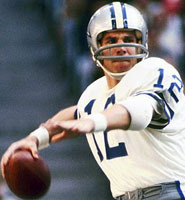 The winning quarterback in each of the first three Super Bowls wore the same uniform number. What number? 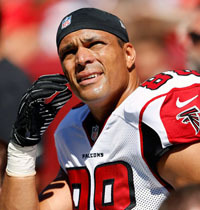 From 1920-1932, professional football employed some African-American players. However, there were none in the NFL after that until 1946, when a team moving its franchise was required by its contract with its new stadium to integrate the team. So the franchise signed two college teammates, Woody Strode and Kenny Washington. (a) What NFL team signed these players? (b) What cities was the team moving from and to? (c) What college did Strode and Washington play for? 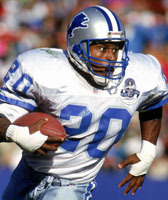 No one in NFL history has ever gained 300y passing and 100 rushing in the same game. However, in 1950, a Hall of Fame QB missed doing so by only 3 yards when he passed for 298 and ran for 99. And this impressive feat occurred in the championship game. 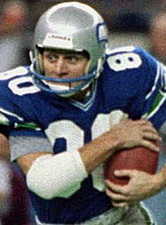 Who is this all-time great? Match each of these players who played in the 1947 NFL Championship Game between the Chicago Cardinals and the Philadelphia Eagles with their colleges. What QB leads the NFL in lifetime interceptions? Only two NFL QBs have at least 20 TD passes in each of their first ten seasons. One of the two is still active. Identify them. The "Fearsome Foursome" was the defensive line of the Los Angeles Rams in the 1960s. Which one of the following players was never a member of the Fearsome Foursome? 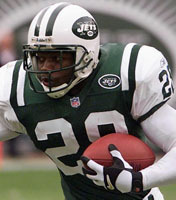 Only one NFL player has ever gained 1,000y rushing and 1,000y receiving in the same season. 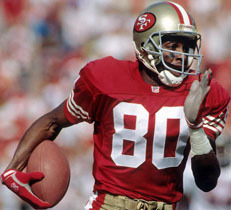 He did it with the 49ers in 1985. 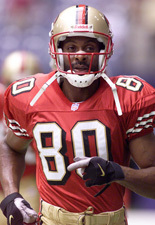 He also led the league that year in receptions with 92. Name the Nebraska alumnus who accomplished these feats. The NFL record for yards gained rushing by a QB is 968 set in 1972 for the Chicago Bears. Name the Kansas alumnus, pictured at the left, who holds that record. In 1992, Brett Favre came to Green Bay via a trade from what team that drafted him? Match each of these NFL stars with his college.